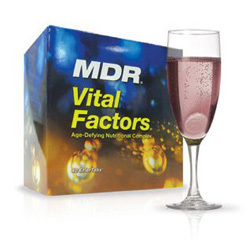 MDR Vital Factors is a nutritional supplement that can help you maintain a healthy mind and body. The special formula claims it can rejuvenating your body on a cellular level, releasing antioxidants, aminopeptides, bio-protectors, detoxifiers, and enzymes that signal every cell in the body to repair, renew, and rebuild. MDR Vital Factors is currently available at Amazon. With your help we can reach more people and let them know about MDR Vital Factors whether this product works or not.